The Martian proves to be a light, pleasant watch, says Raja Sen.
How long can a modern-day space romp go without breaking out the Bowie? In keeping with pop-scored movies like Guardians Of The Galaxy, it has now become merely a matter of time before movies that have any connection to space start flaunting their Ziggy Stardust credentials, and give us a taste of the sardonic Englishman with the sneery vocals. In Ridley Scott’s new film, the song that plays is Starman though -- given the fact that the film is called The Martian -- I’d say Scott missed a trick and should indeed have played Life On Mars. 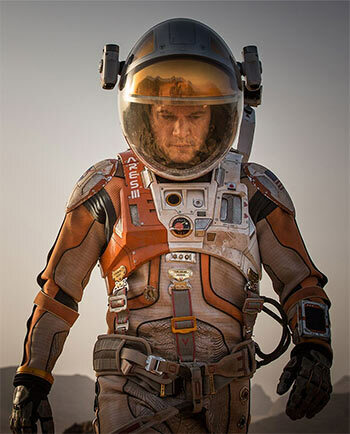 Based on a novel by Andy Weir, The Martian tells the story of an astronaut marooned on the red planet, a man who fights all the odds to stave off madness, to grow food and to stay alive while stuck on a planet unlikely to host visitors for another four years. With Matt Damon in the lead, it all sounds dashed exciting and quite a thrill, and the trailer indeed held much breathless promise, but with no conflict or surprise whatsoever, this remarkably light film plays more like The Swiss Family Robinson with a webcam. Damon is a genuinely charming actor who often finds himself stuck in films that arm characters around him with better lines and more smoothness, and it is a pleasure to see him almost single-handedly man this film, with an unlikely botanist braggadocio and his hatred for disco music. He refuses to turn the beat around, and for good reason. Aforementioned groovy tunes come from his Mission Commander, the flawless Jessica Chastain, in place of actually giving her a character. Scott’s film occasionally details out quirks, but the entire well-picked cast is entirely shrouded in soul-sucking vanilla: Kate Mara has nothing to say, Jeff Daniels plays the head of NASA as he would an 80s President, Mackenzie Davis and Donald Glover are around to lend some geek TV cred, Kirsten Wiig has never been more flavourless, and Sean Bean stays -- shocker of shockers -- alive. Ejiofor, always thoughtful, is nevertheless impressive even in a part that requires him to sigh very awkwardly while texting a man many moons away. The Martian, as you may have gathered, doesn’t therefore possess much in the way of personality, as movies go. The soundtrack tries its best to be Zimmer-y and bronnng-ing in that Interstellar fashion every so often, a film that furnishes a large part of Scott’s cast. Even the pop-culture figures referenced by Damon are caricatures of machismo: Iron Man and the Fonz. Yet The Martian proves to be a light, pleasant watch. Scott’s last few films have been ambitious but daft and it’s refreshing to see him efficiently on autopilot here. No new ground (or sonic barrier) is broken conceptually, and while debris looks sexier with each passing 3D film, this one looks muddy and far from spectacular. There is, however, something peaceful about watching Damon indulge himself this hard, and while he stays mostly bland -- save for growing fuzz for a few scenes and dubbing himself Captain Blondbeard -- he shows how you can go a helluva long way with defiance and duct-tape. Maybe it is high time Mars-movies became more modest affairs. Anyway the red planet seems less scary now that we know it’s wet.